Here’s a bit of an overview of the corner with all the cabinets. Notice the two sewing spots so I can come over and play! On the end of that corner is a raised cabinet for cutting. There are lights under the cabinet above so you never have an Ott light or something in your way of cutting. This cutting table is on wheels so it can be moved around the room. See that black line behind the cabinet? That’s a pop up counter so the cutting table can be made much larger if needed. This angle shows the ironing table and a cozy corner to rest and put your feet up. This is also where we set an extra table if we need to have three people sewing at once. Here’s a better look at the ironing station. The cubbies and drawer provide lots of storage, unlike your typical ironing board that has all that wasted space below. The pull out side accommodates the iron to free up more space. The ironing surface will pop off to reveal a hard surface that can be used as an extra cutting station. The back will pop up to make that cutting surface larger if needed. Have you ever heard of an ironing board that can do so many things? I’m surprised it doesn’t make your coffee too! Over by Mom’s sewing station is a pull out board to set your pattern or book on. That frees up some extra counter space for whatever project you happen to be working on. There’s another pull out board on the other side. Below it is a small drawer for Mom’s laptop (sorry no picture – you’ll have to use your imagination). 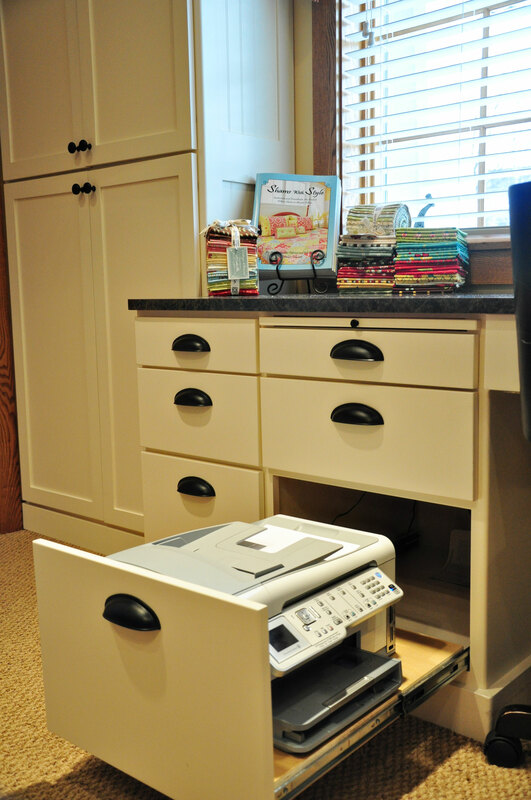 Below the lap top drawer is this – a slide out drawer that houses her printer. I think this is another great idea – having the printer on her counter would take up more quilting space, plus it looks messy. 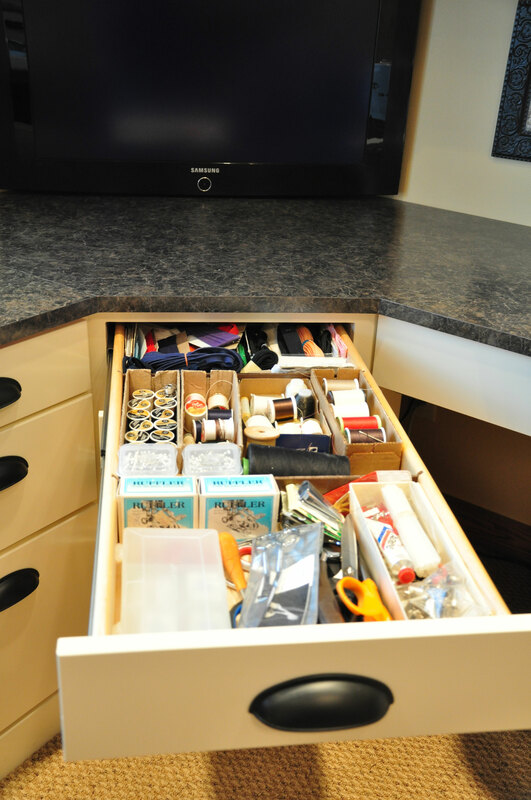 The other drawers all have these great dividers that help Mom stay organized – and after 45 years of sewing, she’s collected a few sewing gadgets! Mom also sews clothes, so there are spots for zippers and serger thread. There is even a spot for Mom to file her paper work, etc. Can you belive it? Plus, I only showed you a few drawers and didn’t even get to the fabric closet! As I said, I just wanted to share all these great ideas with you. My mom is a clever gals and always thinks of great details, which is the reason I am lucky to have her as my right hand gal in my business! She thinks of everything . . . . So which of these details would you like in your sewing room? I want that ironing station. Bad……. To see Part 2 – please click here. This entry was posted in Decorating, My Studio, Quilting and tagged organization ideas for sewing rooms, sewing room cabinets, sewing room design ideas. Bookmark the permalink. Love everything…I’ll have to bookmark this post and come back to it again and again…think I have some serious sewing room envy here! wow, what a fabulous place to hang out. thanks for showing all the drawers…i really want to see the fabric now! I want to go over there and sew. I haven’t seen you gals in ages!!! Or I could do a quilt day too, huh? Just out of curiosity why do so many sewing rooms have the machine on a narrow counter with the wall so close to the back of the machine? I would think this would make it difficult and cumbersome when sewing long strips or once you start getting a larger quilt pieced together. Doesn’t it bunch up along the wall? I am open to any thoughts on this. I sew at my table because of lack of space in my home. That is exactly one thing I,ve always scratched my head over. Why oh why dont they position it in the centre of the room! The wall at the rear restricts all your quilts once it has gone through the needle. Apart from that – a wonderful sewing station. Yes, it does seem awkward to have the machine that close to the wall. You see a lot of that in sewing rooms, for some reason. KItchen countertops are only 24″ deep. It looks like that is what they have used here—kitchen components. Most are 32″ high, but, it looks like they have lowered them with the exception of the cutting and ironing stations. Those are nice to have them up high. The ironing and cutting tables would be difficult to cut anything very large on. It seems that maybe this person does a lot of piecing. I absolutely love this sewing room but I totally agree with you. We are in the process of doing a sewing room addition, 16 x 18, and I am having my husband make me a 4′ x 8′ farmhouse table for this very same reason. I will still have window views but plenty of space to allow my work to go across the table. Especially when sewing bindings on bed size quilts. I agree with you – I’m coveting the ironing station. Now we know where you get all your decorating skills from. Your mom’s sewing room is great. A lot of wonderful ideas. And yes, that ironing station is to die for! Holy. Freakin’. Cow. I am speechless. And envy is a sin, isn’t it? The ironing station is definitely a winner. What a great room! I LOVE seeing other peoples’ quilting spaces. Quilters always seem to have great ideas for making their “nests” work for THEM!! Thanks for the tour. I enjoyed it!!! Great ideas! I’m so glad you shared because that room is AWESOME. She thought of everything! I love the cutting table that pushes back against the wall and the pop up extension table. Love the ironing table too. Such a great room! I want it all! And here I thought I was doing okay… now I have something to pin my dreams on! Absolutely AMAZING. Thank you so much for sharing!! Those are all such wonderful ideas! Thanks for sharing! Wow what inspiration! It just seams so pieceful and soothing. I too want to bookmark this to come back again and again for ideas for “someday”. Thanks for sharing!! I just want the whole room! What a beautiful studio your mom has. How nice she even designed it with a place for you! Guess I’ll go clean my sewing room now…. What a beautiful room! How lucky you are to get to play along in such a pleasant workroom. Very clever storage ideas. I want the ironing station too! I’m thinking maybe a regular old sofa table might be high enough to convert with a padded top. Hmm, thrift store here I come! Wow! That is lovely! I’m in the process of designing my own sewing room (as opposed to a mini sewing nook) and will definitely refer to this often. What a dream space! I badly need a counter height cutting table. Wow, and just in time. I am getting ready to do the cabinetry in my sewing room and now you’ve given me some great ideas…the ironing table though has to be my favorite! What a fantabulous space to be creative in! I have a space I too love, however it is a much smaller space, w/o the wonderful bells and whistles your Mom has designed. I also love the ironing station! I want one……I NEED one…I MUST have one!!! I’ll take the ironing station also. Ironing boards are just so unsteady. I see an ironing station project on my husband’s to do list! Thnaks for sharing the great ideas. One day I’ll have a sewing room….not this big but a small bedroom made into my craft room. I’m definitely bookmarking this post for some great ideas! I think I’d pick the ironing station, too, as my favorite feature! No more ironing board in the center of the room!! Your mom is very clever! Thanks for sharing – I’d die for that room! Love the cutting area, the ironing and the idea of the printer below in out of sight when not in use! 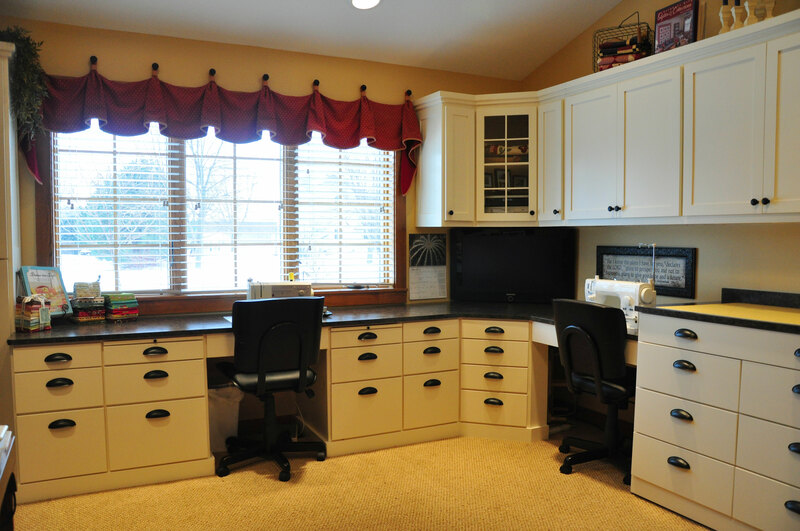 What a great design of a sewing room – the best I’ve ever seen in any magazine! wow! I want one of everything please!!!! LOL, tell your mom she is a genius! I really like the fact that the cutting and ironing board are on wheels and can be moved and extended to become larger. I would love to see either of them opened up! What a clever woman your mother is. WOW! She has more cabinets then my kitchen. I want to come sew. So neat and tidy too! Now, just to find a room that’s as big as my house to fit it all in! LOL What a cool mum you have! 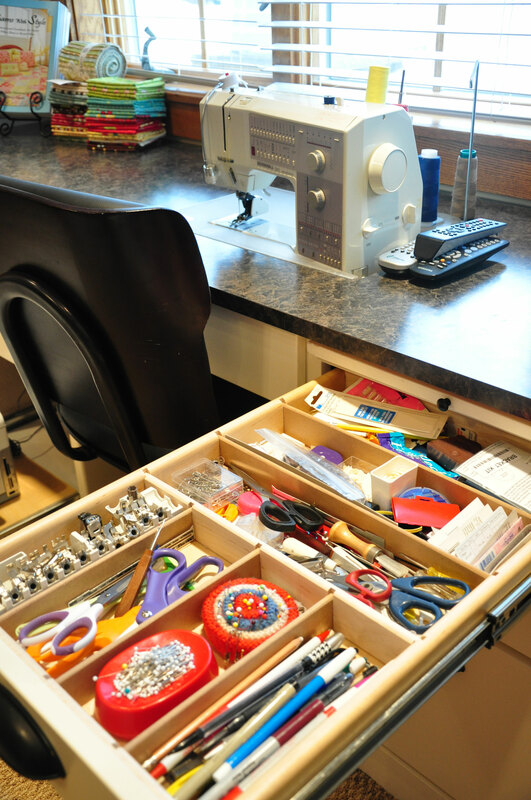 I love the drawer right by the machine that has all the odds and ends right at your fingertips….mine ALWAYS fall off my table as I sew and then I have a BIG mess! Actually I LOVE the whole room, what an amazing place to play..opps I mean work and sew! LOL Thanks for sharing!!! I am sure your mum truly deserves this room but I am green with envy. What a wonderful space. Now that’s what I call a hum dinger! Beautiful! Just wondering what the dimensions of the room are……it seems to be a perfect size. 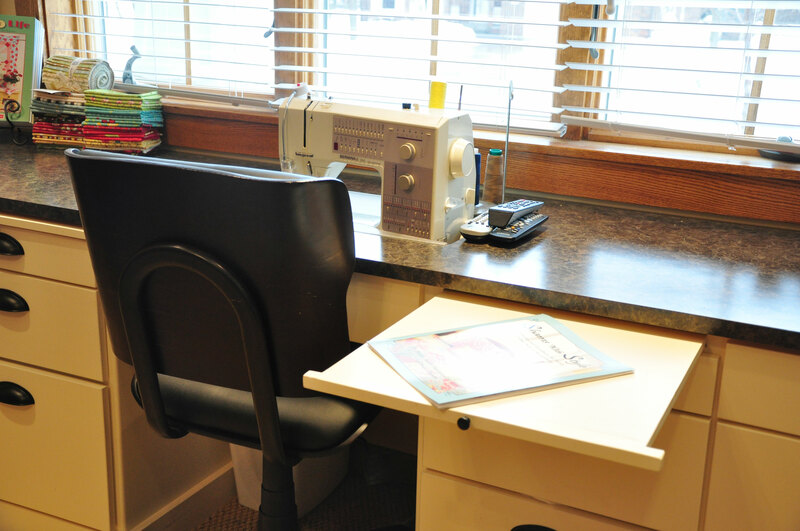 You and your Mom are both lucky to have such beautiful sewing rooms. I would like EVERYTHING! It is designed perfect and would be my dream come true. She deserves every inch of it! Fantastic sewing space!! I love all the organization and great use of space. 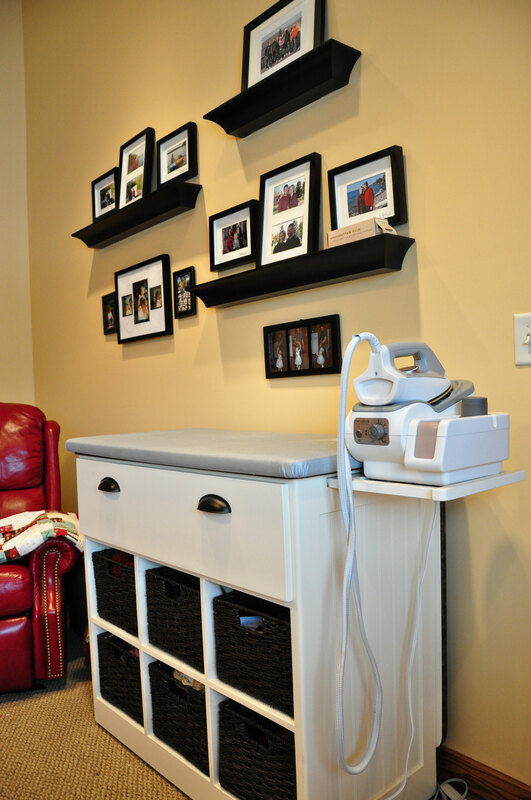 LOVE the ironing station… I am wondering where this can be purchased or if it is a make-it-yourself kind of thing? I’d love to have more info on how to have one of my own!! Wow! What great ideas! If you have time (?) I’d love to see how she stores her fabric, too. Just really great! Wow, that’s all I can say. The ironing station is pretty spiffy! Oh my goodness! What an amazing room. I love all of it. Did she have the ironing station custom made? I picked up my cutting table at Pier 1. It’s the perfect height. It would be great if it had a flip up counter. I have a koala sewing cabinet so I’m pretty spoiled. But I love all the thought that went into your mom’s room. And holy cow, is it always so tidy?!? I love the ironing station….who designed/made that? I do wonder why the sewing machines are so close to the wall….isn’t that cumbersome when sewing larger pieces? Don’t they bunch up behind the machine? Oh my! This is amazing. For goodness sake, show us the fabric closet!! It’s what I picture heaven looking like…. I love to know how to make those window valances… Can we see some detail? Fabulous space….How big is the room? The room is so organized, clean and classy ~ I love it! The iron station is killer and makes total sense. Your mom is brilliant (think you are too, I’ve seen the pics of your sewing/craft room). Think it’s time to have the hubby take and look and see if he can make me one. Ironing board isn’t working and was wondering what the solution would be. Thanks for sharing. The ironing station is nice but I am content with mine right now. What I am admiring is the cutting table and all those drawers! I have a wobbly buffet table to cut on and it is never wide or high enough. Plus, a crafter can never have too many drawers. This room is ABSOLUTELY AMAZING!! Every detail is brilliantly thought out. I recently launched an organizing business and I re-do mostly sewing/craft spaces. This whole set-up is one of the best I’ve seen! Would love that myself. The whole desk system is amazing!! Just fantastic and a dream studio. You and your mum must love working in there. The ironing station is a great idea. Ooooohhhhh…..I LOVE the studio! It makes me want to empty my kitchen and redesign it as my quilting-room! I did send my bee-friends the link to your web-log and they wondered how the beautifull room would look when in use bij your mom…..? Our rooms always look like some wild animal ran around en took everything apart…….. Happy greetings from some jealous quiltlady’s from Holland! That is the ideal sewing room. I love it. What a perfect sewing room. Obviously a lot of thought and planning went into this! I love the roll out cutting board station. I also love how clean everything is and that there is a place for everything. This is like a DREAM sewing room! Oh wow, I want it all!! The ironing station and cutting station with the pull out extra space if I had to choose. Thanks for sharing this, I love to see how others organize! I love all of it and especially the ironing station. Where did the cabinets come from? I can’t imagine ever wanting to leave such a beautiful space! I’ll bet those fabric closets are full of your beautiful fabric line too! I am jealous! What a dream! I’m envious of the entire room. sure beats the table from Ikea that I sew on (which isn’t bad BTW) Thanks for sharing the pictures. WOW! I want it all! Who is the manufacturer of the cabinets and counter tops? And it’s sooooo clean… nice place for creative juices to flow! That is one awesome sewing space. I love all the storage and clever use of design, such as the pull out cutting surface and ironing board. The choice of cabinetry is great too. OMG! What awsome ideas. I’m just starting to design my quilting space and I’m definitely going to use some of her ideas in my room. Can we also see her fabric storage system? I can’t imagine anyone who does any type of sewing not wanting this room! 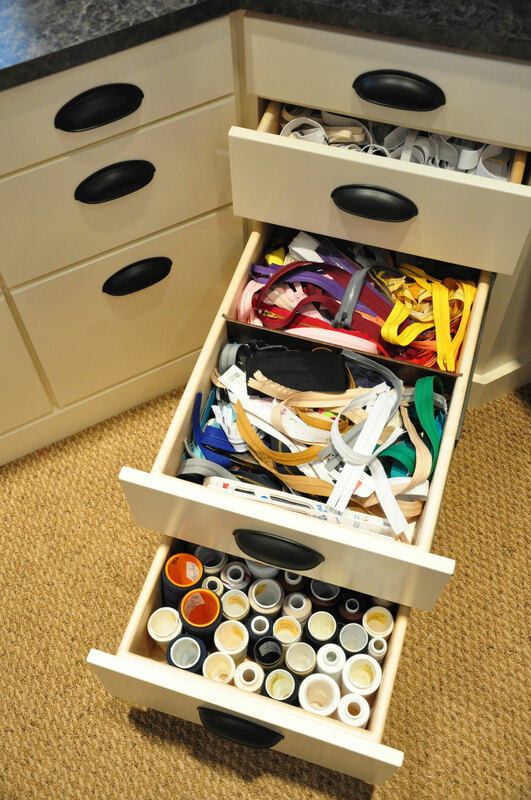 A couple of things to note for others – the drawers appear to have full-extention glides on them which makes every inch of your drawer space accessible. 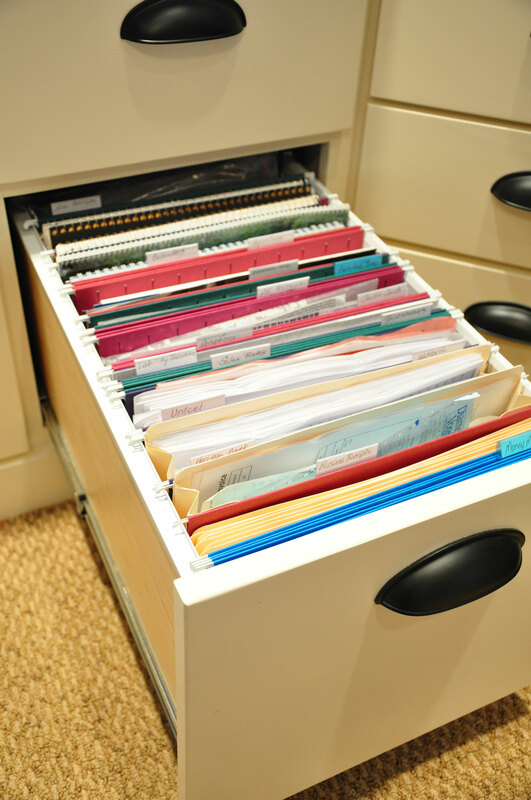 The file drawers – we incorporate them into almost every piece of cabinet/desk/buffet type of furniture my husband makes (he is a hobbyist) and they are one of the most indispensible features when all is said and done! This is the best ! I’m just starting to design my sewing studio and I was hoping I could find pictures like this for my contractor. I would love to see more like the cabinets that hold the fabric. Thank you for sharing this. It’s amazing! 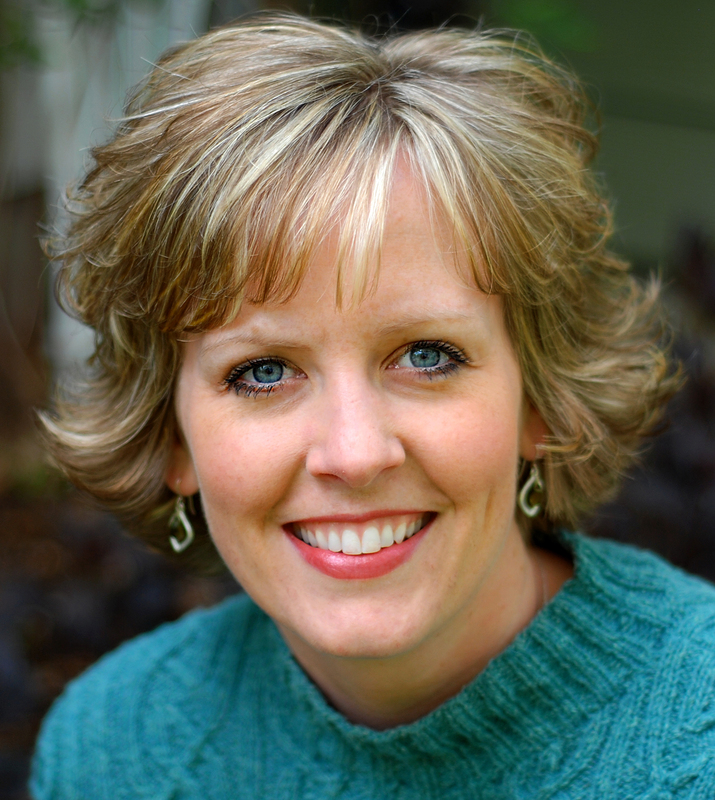 It really is helpful to me too b/c we are in the process of designing my sewing room. I love the cutting table features, hiding the printer and that ironing station. Wow! Wow, Wow, Wow!!! I’ll have to remember this when we move (and I get a sewing room of my own). Do we get to see the fabric closet next? Can your mom adopt me and can I go live with her!! JEALOUS!! What a fab space!! There is too much in there to decide what exactly I would want except for EVERYTHING!!! Way to go mom! What a beautiful sewing space and I envy your mom. She’s done a fabulous job designing her space. Thanks for sharing it with us. Show us more! I’d love to see the fabric areas!!! Oh, my goodness! I have serious sewing room envy! Are these custom cabinets or stock cabinets? I have long folding tables but I want something more permanent with drawers and shelves. Everything that is stock is too tall. How did she know what dimensions for the cutout to sit her sewing machine down in? I can’t even go into the ironing station without tearing up! So I guess my question is, how do I duplicate her entire room? Pass on to her that she did an awesome job! Thankd you so much as this is such a well planned room. 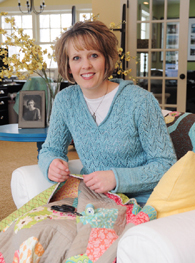 Many more wonderful years of sewing to your Mom. If you would, please share the dimensions of the room. I love it! But I need my scrapbooking and easil and painting area all in the same room as well. I also like sewing at a table so large projects can (hang over the back and) have somewhere to go. Be still my heart!!! I want it all! Wow – I want your mom to come and help me design wall cabinets for my studio! What an incredible room – a true delight for any sewer! Hi there…love the room…I am looking at doing something similiar but I am wondering how does one remove the sewing machine for servicing? The machine is removed from an opening in the countertop. Mom ordered a plastic piece that fits around her machine, and sets into the countertop. You then remove the plastic piece to get access to the machine. Where are you getting all your specialty parts and cabinets? That is definitely what I would call a beautiful Designer Showroom, I meant to say Sewroom. When I win the power ball, do you think your mom will design me a room? I am on the envy side along with many of the others, but then I am also so happy for your mom cause I don’t think there could possibly be a better sewing room than this one! Do you know where your mom got the organizer for the sewing feet that stores so nicely in the drawer? Your sewing room is beautiful. I need to set up my sewing room. Very much interested in the furniture. Where can I get the cabinets? Desperate for a sewing room makeover as soon as possible. Wow! We are building a new house, and I’m stealing…ummm, copying a LOT of ideas from this post. One question, did your Mom have a cabinet person modify existing sewing room cabinets or make hers from scratch? Yes, LOVE the ironing station also, and the rolling cutting stations. Would love to know more about the person who made it all for her. Thanks! I would love to see the fabric storage! 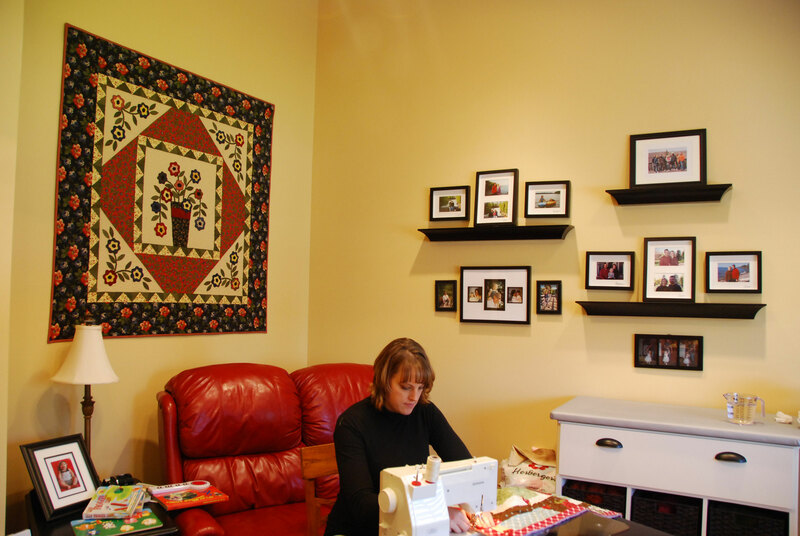 It seems that we never see a quilting frame in anyone’s sewing room. Most people nowadays piece and quilt, and sew home decor rather than sew garments. So, with so much piecing going on, by what method do they quilt the piecing? Does no one do fine hand quilting anymore? Garment sewing is sadly declining. What a shame! If it is pieced quilting that is going on, where does the quilt get laid out to tack it together? Do they hang it so that it drapes over the narrow table top? That would probably work. One advantage to having narrow countertops is that they are easy to reach across. And, one last question—does it always look this neat and clean? How wonderful if it does! For some of us it is so much more pleasant to work in nice order like this, rather that a mess o’ stuff. Sure, some do thrive in a mess. Not me, I guess. I don’t know that garment sewing is declining. In my little corner of the world, I know a lot of people that sew their own costume pieces and design clothing and garments that suit their own lifestyles. I also know people that are re-purposing thrift store finds. I think that there is an upswing in garment sewing. How big is that room? I wonder how much room I would need. You must have had a carpenter do that magnificant woodworking. Yes, they are made by cabinet maker. The room is about 13 x 14. !!! WOW!!! I will like it all… this is a real sewing room….congratutation for your Mom. Wow,Wow and triple Wow. We are building a new house so this has come at the right time as i am going to have a brand new sewing room with 3 large windows. I have been down in my laundry room for the last 18 years so now it is my turn. Thank you so much. This room is amazing! I am in the process of getting ideas for my new sewing room. Could you post more photos – maybe of the fabric closet? Love the room! What brand of cabinets are they, They have a lot of great features. I agree, great cabinets. Love all of the storage space. Please share with us the cabinet info. I love this room and all the thought put into designing the special pieces of furniture! Any chance you can post pics of the cutting table with the extension up? What holds the table part up? I love your sewingroom. I’m doing a room myself. Where did you get those cabinets? Did you use a cabinet maker. I to question the space between the machine and the wall. My room is 12 by 22, bamboo flooring.I thought about using unfinished cabinets, but the height is to tall.Share any suggestions please. You mentioned that th4e cutting table is on wheels and could be pulled out into the center of the room. It also has an extendable surface that can be extended to double the cutting surface. Is is made of a material that would allow the use of a rotary cutter without marirng the surface? Where did you find the plans or did you design it yourself and have it custom made? This looks wonderful. i don’t have room for this but it has given me some great ideas for my smaller space. would like to know the height of the cutting table. Oh wow. Wonderful room. If I could get my sewing room that cclean I would never sew again I am afraid. Just beautiful. Wonderful room. I am looking for ideas for a smaller sewing room, but this is fabulous and certainly gives me lots to think about for my space. Do u have the pattern for the ironing station. Sorry, but no I don’t. It was designed and drawn up by the cabinet maker. 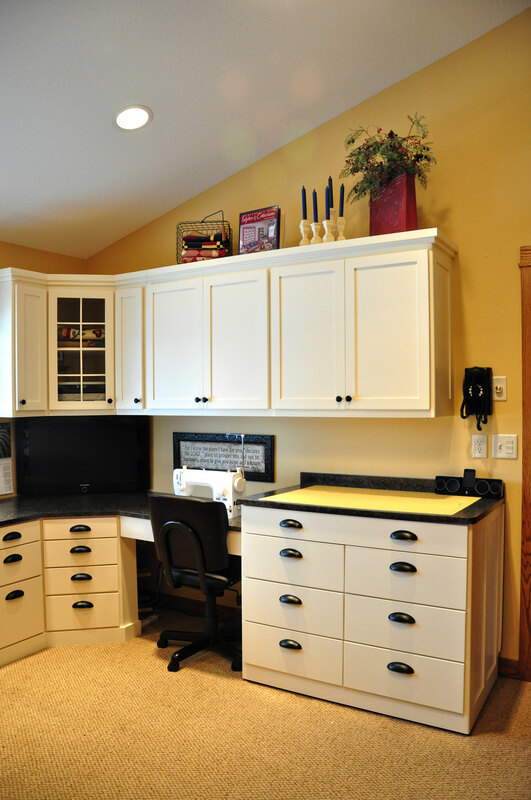 The cabinets were done by Zuegcraft Cabinetry of Willmar, MN. I am sure the cost would vary greatly depending on who is making the cabinets, the finish, the style of the cabinets, the number of cabinets, etc. Is there any way that you could post a picture of the cutting table completely opened? I love this room and would like to be able to make the same table. Thank you!!!! After years of using the formal living room for sewing, my husband said “get a designer in here and get the room done right”. He didn’t have to tell me twice! The search was on for ideas! I found a picture of your mom’s sewing room and knew instantly what direction to go. Such wonderful storage and organization. Love the ironing station and mobile cutting table. Thank you so much for sharing! Love this room! I would like to see the cutting cabinet counter top open, too. I also have a new house and a room to design for my sewing/quilting/scrapbooking/office. I want to make the space efficient and organized. I think my room is a wee bit smaller and the windows go down to about 20 inches from the floor. Would like to see the fabric storage, too. Thank you so much for sharing!! I came across this on Pinterest and just wanted to say how inspiring and amazing your mom’s sewing room is. The thought process you mom used in creating the ironing table is incredible. It is so efficien! 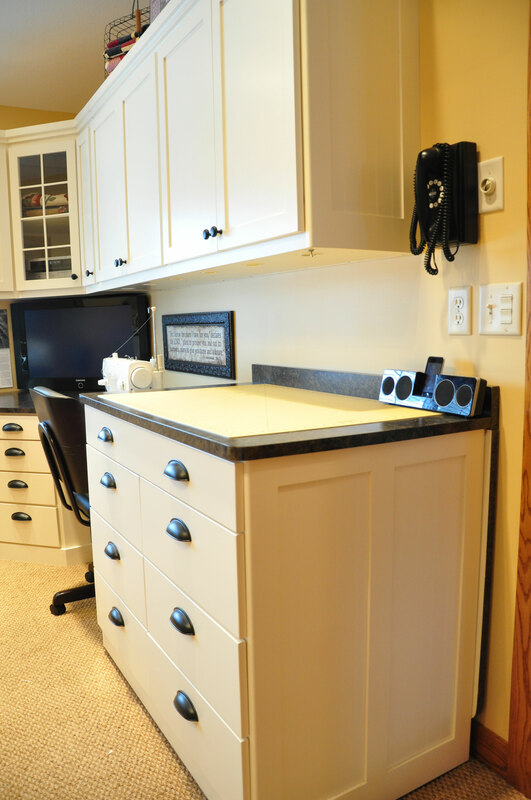 I love how there are sewing stations and the move able cabinet with an extendable top! Brilliant! Thank you so much for sharing! just found this and love it. I would love to see how the extension works for the ironing station and cutting table? Is it also on wheels? Thanks for the great ideas. Love these ideas! I too, would love to see how the extension works for the cutting table! Who made the iron table set up? Great craft and sewing room! I like that everything has a place and not all over the counters! That ironing station is my next project for my new quilting room! Thanks for sharing! Her cabinet maker custom made it for her. I would like to know the height of the ironing station…please and thank you.